At this point in time, no other sandwich I make is more requested. Instead of a classic BLT sandwich, I make a TLT - tempeh, lettuce, and tomato. Not an original concept, but my secret is this...every component needs to be over-the-top flavorful. 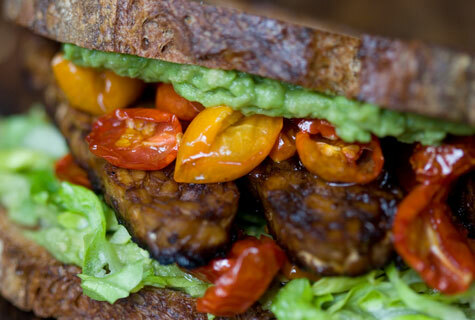 My version features chipotle-marinated tempeh alongside oven-roasted cherry tomatoes, a bit of shredded lettuce and a generous slather of avocado on a thin slice (or two) of great bread. For anyone looking for a hearty, substantial, satisfying, nutritious, and meatless lunch - it's hard to beat . You'll need to plan ahead a bit to marinate the tempeh and roast the tomatoes, but I promise it's well worth the effort, and if you make extra you'll have sandwiches for the week. Tempeh is easy to find in most Whole Foods Markets or natural food stores - here's a link to another favorite tempeh recipe in case you are interested in other ways of using it. I enjoy this sandwich on a big, ultra-thin slice of whole wheat walnut bread - toasted until crisp. Now I'm thinking that miniature versions of these might be great bite-sized party food? I buy the Lightlife organic flax tempeh or the grain version. A bit of crumbled goat cheese might be good too. Whisk together the 3 tablespoons of olive oil, shoyu, balsamic vinegar, brown sugar and adobo sauce. Pour 1/3 of the tempeh marinade into an 8x8 baking dish (or something comparable) - you want a dish that is just big enough to hold the tempeh in a single layer - this way it will be fully enveloped by the marinade. Pour the remaining marinade over the top of the tempeh, cover and keep in the refrigerator for a couple hours, overnight or until ready to use. 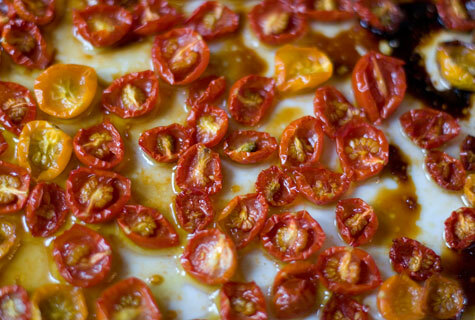 While the tempeh is marinating, go ahead and roast the tomatoes. Cut each tomato in half and arrange them in a large oven-proof baking dish. Mix together the olive oil, sugar, and salt and pour this over the tomatoes. Gently toss them a bit, making sure they all get coated, finishing with each tomato facing cut-side up. Place in the oven and bake for 45 minutes or so, until the tomatoes are shrunken and sweet. When the tempeh is done marinating heat a large pan over medium-high heat and cook the tempeh slices for a few minutes on each side. You may need to do this in batches if you don't have a big enough pan. Set the tempeh slices aside until you are ready to assemble the sandwiches. To assemble each sandwich take one slice of bread and slather a generous layer of mashed avocado. Place a small helping of the shredded lettuce on top of the avocado, a few tomatoes, then a few slices of the tempeh, and more tomatoes. Enjoy either open faced or topped with another avocado-slathered bread slice. A fantastic salty-sweet grilled tempeh recipe. The marinade is made from a simple (but effective) combination of maple syrup, soy sauce, garlic and ground chipotle pepper.